Talk about being at the right place and at the right time. Following revelations of government spying, data breaches, malicious hacking, identity theft and other online threats, the email and file encryption application Virtru has now grown to over 4,000 customers and has closed on $29 million in Series A funding, the company announced this morning. The round was led by Bessemer Venture Partners, and included New Enterprise Associates (NEA), Soros Fund Management (chaired by billionaire George Soros, also head of the rights-focused Open Society Foundations, which pushes for accountable and tolerant democracies), as well as Haystack Partners, Quadrant Capital Advisors, and Blue Delta Capital. Along with the new round, Wayne Jackson, CEO of Sonatype and former CEO of Sourcefire, will join the company’s Board of Directors. He will serve alongside BVP Partner David Cowan who co-founded cyber security companies VeriSign, Good Technology and Defense.net, and Authentic8 CEO Scott Petry, who founded the email security company Postini. Launched back in 2014, Virtru was founded by brothers John and Will Ackerly, both with a tech background in the government sector. Will, in fact, was a cloud security engineer with the NSA while John advised the White House on technology issues, including digital privacy, before leaving for private equity. The two had the idea to bring security and privacy to the applications people use every day – but in a way that made it easier to implement for the everyday user. The first product to debut was a Chrome and Firefox extension that integrated with popular email services like Gmail, which allowed users to secure their email with end-to-end encryption and specify how long the email could remain in someone’s inbox before being automatically deleted, or whether email forwarding was permitted. Since then, the company has brought its encryption, access control and data loss prevention (DLP) tools to services like Gmail, Google Drive, Yahoo, and Outlook (2010, 2013, 2016). It also has its own, standalone email apps available on Google Play and the iTunes App Store With the funding, it will work on expanding to other cloud platforms, such as Microsoft Office 365. It will also further develop its SDKs and APIs so software developers can integrate Virtru into their own applications. Virtru’s Encryption-as-a-Service architecture is built on the Trusted Data Format (TDF), an open-source technology built by Will, which wraps each content object in its own secure envelope that can only be accessed by the authorized parties. Customers manage their own encryption keys and can revoke others’ privileges and access at any time, even after the data is open or shared. This year, the company has also rolled out other features, including encrypted search for searching encrypted content in an email or file; hardware-based encryption keys; and it debuted its SDK. What makes the technology interesting and notable is not that it’s necessarily the most secure – John admitted before that there are more secure means of online communication – but those tend to be hard to use and expensive. Instead, Virtru is simple enough for anyone to understand, and it works across different platforms. And it’s free for personal use, with tiered pricing for Pro ($5/month) and Enterprise use. While the inspiration for the product was on simplifying security for everyone, Virtru is now used by businesses, in addition to individuals. 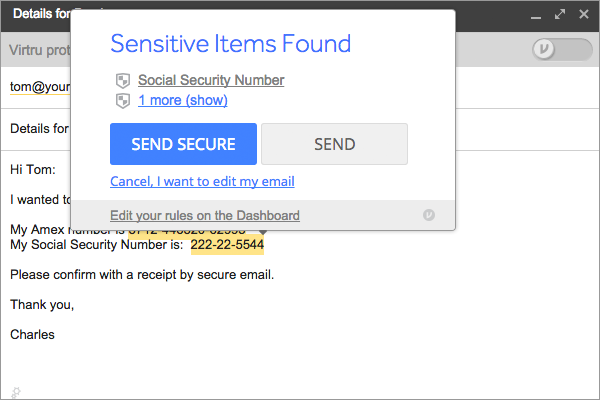 Its software makes it simpler for businesses to manage security and encryption in Gmail, Google Drive and Google Apps, and helps businesses with things like CJIS, CFPB and HIPAA compliance as well as IP Protection, among other things. Today, it touts customers in the media, entertainment, government, healthcare, financial services, and manufacturing sectors. The funding is notable giving the crunch affecting startups’ ability to raise – especially in the crowded cybersecurity sector, which was cited earlier this year as seeing a funding “drought.” BVP’s Cowan said at the time that many startups arriving on the scene were copying technology on the market already, or were launching products hackers had already figured out how to circumvent. The challenges led to startups taking longer to close deals, having to cut spending, or looking for exits. For the time being, however, Virtru does not appear to be in that bucket.